With 10 LEDs: Consisting 10 LEDs in this solar sensor lamp, 18 lumens, giving soft light beam, no glare, its lighting is harmless to your eyes. 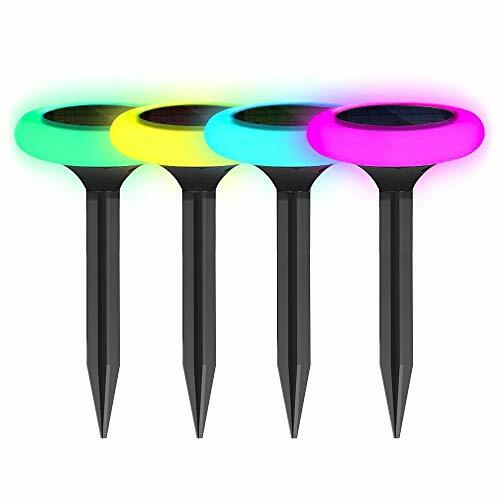 Colorful lamplight: There are 8 kinds of lighting displays, and you can press its switch button momentarily to select its lighting color among red, orange, yellow, green, blue, purple, white, and gradient color. Solar-powered item: Solar panel mounted on the top of the lamp effectively transforms solar energy into electric energy and stores it in the built-in battery, no wire needed, auto charging in the daytime and turning on at night. Waterproof function: With the IP65 waterproof grade, this solar torch light is durable and reusable, suitable for indoor and outdoor use. Perfect decoration: LightMe solar torch lamp is a kind of great decorative item, perfect for decorating your yard, garden, pathway, fence and other outdoor environments.